Alloy steels consists of a group of steels which shows mechanical properties superior to those of ordinary carbon (C) steels as the result of additions of certain alloying elements such as chromium (Cr), nickel (Ni), and molybdenum (Mo) etc. Total content of the alloying elements can range from 0.5 % to 1 % and up to levels just below that of stainless steels. For many alloy steels, the primary function of the alloying elements is to increase the hardenability in order to optimize mechanical properties and toughness after heat treatment. However, in some cases the addition of the alloying elements is used to reduce atmospheric degradation of the steel under certain specified service conditions. Alloy steels are used in a broad range of applications. In some cases, corrosion resistance is a major factor in the selection of alloy steels, while in other applications; it is only a minor consideration. The information available on the corrosion resistance of alloy steels is end use oriented and often addresses rather specialized types of corrosion. Many applications use steels with a rather low content of the alloying elements, high strength low alloy (HSLA) steels, and structural alloy steels. Small additions of some alloying elements usually enhance corrosion resistance in moderately corrosive environments. However in severe environments, the corrosion resistance of this group of steels is often no better than that of C steels. Certain applications need more highly alloyed steels which, in addition to achieving the required mechanical properties, provide increased resistance to specific types of corrosion in certain environments. In this group of steels, corrosion resistance is also an important factor in alloy design. Atmospheric corrosion is a factor in nearly all applications of alloy steels. It is the principal form of corrosion of concern in the automotive, highway equipment, machinery, construction, and aerospace industries. The atmospheric corrosion resistance of various alloy steels, as well as the role of various alloying elements, depends on the severity of the environment. Corrosion rates vary as the environment changes such as from industrial environment to the rural environment. Some industries which use alloy steels have certain specific corrosion problems. These include (i) the production, refining, and distribution of gas and oil, (ii) energy conversion systems involving the combustion of fossil fuels, (iii) marine applications, and (iv) chemical process industries. During the drilling and primary production of gas and oil, alloy steels are exposed to crude oil and gas formations containing varying amounts of hydrogen sulphide (H2S), carbon dioxide (CO2), water, and chloride compounds. 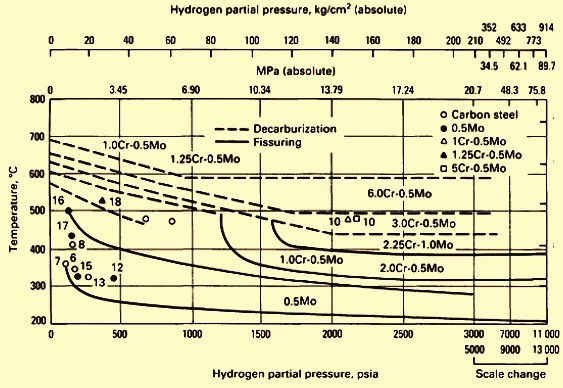 High pressures and temperatures are also encountered in some cases. Refining operations expose low alloy steels to environments containing both hydrogen (H2) and hydrocarbons. Transmission and distribution of gas and oil expose pipelines and piping systems to environments containing varying amounts of many of the constituents mentioned above. In most cases, energy conversion systems involve consideration of the corrosion problems associated with the combustion of fossil fuels. Contaminants in coal, oil, and natural gas result in the accelerated attack of alloy steels at higher temperatures. In steam based power plants, corrosion due to impurities in boiler feed water and in high pressure high temperature steam needs to be addressed. Alloy steels are often used in marine environments involving direct contact with seawater. Examples of such applications are ship construction and offshore drilling equipment. Alloy steels used in the construction of chemical processing plants are subject to corrosion from a wide range of atmospheres. Typical atmospheres contain compounds of chlorine (Cl), sulphur (S), ammonia (NH3), as well as various acids and alkalis. Atmospheric corrosion resistance is of concern in many of the applications for alloy steels. The atmospheric corrosion resistance of alloy steels is a function of the steel composition and the specific environment. Some of the available information describes the effects of various alloying elements on corrosion resistance while in some other information specific steel specifications are addressed. Hence, the available information provides a general guideline for the selection of alloy steel based on overall content of the alloying elements. Many of the available information have been developed over a long period in three environments namely (i) industrial, (ii) semi-rural, and (iii) marine. These informations show that the long term atmospheric corrosion of C steel can be reduced with a small addition of copper (Cu). Addition of Ni is also effective, and Cr in adequate amounts is helpful if Cu is present. The maximum resistance to corrosion is usually obtained when alloy contents are raised to their highest levels. Fig 1 summarizes some of the results from industrial environments. It can be seen that the C steel corrosion rate becomes constant after around 5 years. The corrosion rate of the Cu steels level off to a constant value after around 3 years, and the HSLA steels, which utilizes several alloy elements, shows a constant rate after around 2 years. 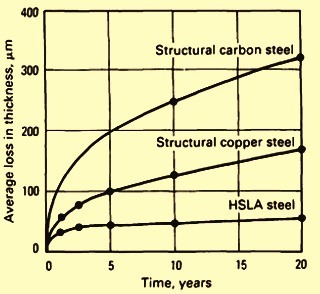 Corrosion of HSLA steels eventually ceases. Also from the available informations, it is evident that the low alloy steels show considerably better performance than either C steels or the structural Cu steel. Though the available informations provide good estimates of average corrosion behaviour of the alloy steels, it is important to note that there is significant increase in the corrosion rates in the severe atmospheres. However higher content of alloying elements have a positive effect on the corrosion resistance of the alloy steels. Protective coatings offer a means of providing significant additional protection from atmospheric corrosion. Well cleaned, primed, and painted alloy steels usually give good service in many applications. Galvanizing is also used to provide protection even under conditions in which the corrosive environment is quite severe. This zinc (Zn) coating is anodic and corrodes preferentially and this protects exposed steel surfaces existing at cut edges or other areas where breaks in the coating are found. Corrosion resistance increases with coating thickness. In mild environments, galvanized steels are normally used with no further treatment. In more severe environments, galvanized steels are painted. In certain cases, a prior treatment is used to provide a Zn phosphate conversion coating over the Zn coating to improve paint adherence. Also, electroplating, usually with Cr, is used where decorative requirements are to be met in addition to atmospheric corrosion resistance. As with C steels, alloy steels are used in a wide variety of industrial applications. The four major industries which rely heavily on alloy steels are (i) gas and oil production, (ii) energy conversion systems, (iii) marine applications, and (iv) chemical processing. A variety of corrosion problems are normally encountered in the drilling and primary production of gas and oil. These include weight loss corrosion, pitting corrosion, corrosion fatigue, stress corrosion cracking (SCC), sulphide stress cracking (SSC), and H2 induced cracking (HIC). In relatively shallow gas and oil wells, lower strength C or C-Mn (manganese) steels are employed in many of the components used in drilling and primary production. Gas and oil deposits are often such that corrosion is limited to weight loss corrosion and this can be effectively controlled by chemical inhibition. However, in the case of deep wells high strength alloy steels are normally used. Also, in deep wells very hostile environments are frequently encountered especially the high H2S levels. For example, in the case of deep gas wells formations have been encountered in several places with H2S concentrations ranging from 25 % to 45 %. In addition, temperatures up to 200 deg C are also there along with pressures up to 140 N/sq mm. Also, H2S is often found in combination with chloride containing brines and CO2, which add to the harshness of the environment. Though chemical inhibition is used even in deep wells to control weight loss corrosion, the presence of H2S still results in the embrittlement of high strength steels. This phenomenon, known as sulphide stress cracking (SSC), depends on H2S concentration and temperature. An example, typical SSC data for alloy steels used in oil field tubular components shows that as temperatures increase, some higher strength steels can be used and resistance to SSC can be still maintained. However, higher strength steels are generally more susceptible to SSC than lower strength steels. SSC resistance is influenced by steel microstructure, which in turn depends on steel composition and heat treatment. It is normally observed that a martensitic structure provides better SSC resistance than other microstructures. Thus, it is important to select an alloy steel which has sufficient hardenability to achieve 100 % martensite for a given application. Moreover, proper tempering of martensite is essential in order to maximize SSC resistance. It is generally noticed that higher tempering temperatures improve SSC performance. However, the presence of non-tempered martensite is highly detrimental to SSC resistance. Water quenching from above the Ac1 temperature results in non-tempered martensite with a consequent loss in SSC resistance. It has also been found that the development of a fine prior austenite grain size and the use of accelerated cooling rates after tempering improve SSC resistance. The necessity for adequate hardenability is quite evident when considering alloy steels for heavy section well head components. The SSC resistance of conventional steels used in well head equipment can be improved through modifications in composition, which increase hardenability. With the advent of enhanced oil recovery techniques, additional corrosion problems are required to be considered in gas and oil production. CO2 injection is one method of displacing crude oil from a formation for increased recovery. This method involves development of CO2 source wells, that is, those having large quantities of CO2 containing gas. The gas from these wells is processed, transported to the production reservoir, and injected. Corrosion in CO2 source wells and in production wells results from the highly acidic environment created when CO2 and water are present. The presence of chlorides and H2S adds to the aggressiveness of the environment. Furthermore, corrosion rates change as temperatures change. The lower alloy steels show a slight increase in corrosion rate with increasing CO2 concentration, but the higher alloy steels show little or no dependence on CO2 level. As Cr content of the alloy steels increases, corrosion resistance improves at a given CO2 level. However, at a temperature of around 180 deg C the corrosion resistance of the lower alloy steels improves, but that of the higher alloy steels remains the same or decreases. With the addition of substantial amounts of chloride at around 70 deg C, some of the higher alloyed steels begin to show an increase in corrosion rate with increasing CO2 level. An increase in chloride concentration, along with an increase in temperature, results in a significant decrease in the corrosion resistance of many of the highly alloyed steels. Also, if H2S is present in CO2-brine environments, the corrosion rate of lower alloy steels is expected to increase. The corrosion rates of different alloy steels in CO2-brine-H2S environments vary considerably with the specific environment faced. As a result, control of the environment through chemical inhibition turn out to be an important tool, along with alloy selection, in reducing corrosion failures. The main concern in hydrocarbon processing and petroleum refining is the problem of the interaction of H2 with the alloy steels used in these applications. Long exposure to H2, particularly at higher temperatures, results in loss of ductility and premature failure. At higher tensile strengths (TS), the effect of H2 is more severe. The phenomenon often encountered in actual service is H2 attack. This involves the chemical reaction of H2 with metal carbides at higher temperatures to form methane (CH4). Because CH4 cannot diffuse out of steel, an accumulation occurs, and this causes fissuring and blistering. The combined effect of decarburization and fissuring on alloy steels results in loss of strength and ductility. The empirical limits on the use of alloy steels commonly used in a H2 environment are usually shown in by the Nelson curves (Fig 2) which are normally continually updated as additional service experience is assimilated. The transmission of gas and oil involves consideration of the corrosion problems associated with line pipe steels. In addition to C steels, HSLA steels are frequently used in pipeline service. Atmospheric corrosion is required to be considered for exposed pipelines, and the corrosive actions of various soil formations are also to be taken into account. From the available informations on the corrosion faced by different alloy steels in various types of soils, it is apparent that factors such as soil pH, resistivity, degree of aeration, and level of acidity have more bearing on the severity of corrosion faced than the content of the alloying elements in the steels. In some cases, increasing content of the alloying elements has a beneficial effect, but in other cases, it is not. In general, the use of protective coatings and cathodic protection offers the best means of reducing the level of corrosive attack. Line pipe steels can be susceptible to a specialized form of H2 damage when H2S is present in gas and oil. This type of embrittlement, known as H2 induced cracking (HIC), results from the accumulation of H2 at internal surfaces within the steel. Examples include interfaces at nonmetallic inclusions and at microstructure constituents that differ considerably from the surrounding matrix. Martensite islands in a ferrite-pearlite matrix are typical example. Micro-cracks which form at these interfaces grow in a stepwise fashion toward the surface of the pipe, with the resulting failure. Substantial investigative work has been done to understand the nature of the problem and to develop preventive measures. HIC is normally prevented by control of the environment, examples are dehydration to remove water and through chemical inhibition. A number of metallurgical factors have also been identified which influence resistance to HIC and offer a means of reducing the susceptibility of line pipe steels to this form of embrittlement. Two factors which influence the susceptibility of line pipe steels to HIC are steel cleanliness and degree of alloying element segregation. This might be expected, because the degree of steel cleanliness affects the volume fraction of non-metallic inclusions present and therefore the number of interfaces available for the accumulation of H2. Segregation of alloying elements can lead to the formation of low temperature austenite decomposition products, thus providing additional sites for H2 accumulation. HIC has been found to be associated with manganese sulphide (MnS) inclusions which have elongated during hot rolling. Elongated silicate inclusions also provide interfaces for H2 accumulation. Laboratory tests have shown that reduction in the S level of a line pipe steel reduces susceptibility to HIC. Reduction of S levels to 0.002 % or less can result in a considerable improvement in resistance to HIC. It has also been observed that resistance to HIC is improved through the use of sulphide shape control techniques. Calcium (Ca) or rare earth metals are added to the steel to form Ca sulphides or rare earth sulphides. These inclusions are not plastic at hot working temperatures and therefore do not elongate during hot rolling. The effects of various alloying elements on resistance to HIC are not clear and somewhat controversial. The alloying element that has received the most attention is Cu. Laboratory results have shown that Cu can considerably reduce susceptibility to HIC. Apparently, the benefits of Cu are realized only in atmospheres with a pH of 4.5 to 4.8 and above. At pH levels less than 4.5, Cu has no effect on the resistance to HIC. Corrosion problems associated with energy conversion systems often concern the combustion of fossil fuels. The most typical applications involve the operation of coal fired and oil fired steam boilers. In these applications, corrosion due to boiler feed water and high temperature high pressure steam need to be considered. Combustion of fossil fuels can result in so called fire side corrosion, which is a high temperature attack on steel surfaces stemming from the products of combustion. There are three general areas where external corrosion problems occur. These are (i) the water wall or boiler tubes near the firing zone, (ii) the high temperature super-heater and re-heater tubes, and (iii) the ductwork that handles the combustion flue gases. Corrosion of the ductwork is a low temperature attack that results mainly from acid condensation. Prevention of this corrosion depends primarily on maintaining flue gas temperatures and steel surface temperatures above acid dew points. Corrosion on water wall, super-heater, or re-heater tubes results from fuel ash deposits at higher temperatures. In these situations, the corrosive nature of fossil fuels varies considerably with the chemical composition of the fuel. It is to be noted that many fuels are not especially corrosive. However, coals containing significant levels of S and alkali metals are particularly damaging, as are oils that contain alkali metals, S, and V. These constituents have been identified as principal sources of corrosive attack in a number of studies involving the analysis of fuel ash deposits on boiler and super-heater tubes. In the case of coal combustion, corrosive attack results from complex chemical reactions involving S and alkali metals [sodium (Na) and potassium (K)] to form alkali sulphates. These alkali sulphates, along with sulphur trioxide (SO3), react with the protective iron oxide. This reaction breaks down the iron oxide and forms a complex alkali iron sulphate. At temperatures of 430 deg C to 480 deg C, this deposit can spall from the surface, exposing fresh iron for further attack. Such is also the case with water wall tubes. As temperatures increase to levels encountered by super-heater or re-heater tubes (e.g. 570 deg C to 700 deg C), the complex sulphate becomes liquid and attacks the tubes directly. Corrosion rates increase with temperature until the sulphates become unstable, leading to a decrease in corrosion rate. From the various informations available it can be seen that, although alloy steels can be used in these atmospheres, but they do not perform as well as stainless steels. Several courses of action are taken to prevent fire side corrosion in coal fired facilities. At the lower temperature encountered by water wall tubes, procedures are implemented to avoid spalling of combustion deposits. These procedures involve controlling fuel flow and combustion conditions to avoid impingement by particulate matter on critical steel surfaces. At higher temperatures, where liquid phase attack can occur, protective shields are used to maintain steel surfaces at temperatures above the corrosive range. The use of coal blending to counteract the corrosive nature of a given coal offers an additional means of corrosion prevention. Also, studies have shown that certain additives to coal are effective in reducing corrosion rates. Success has been achieved with kaolin, diatomaceous earth, and magnesium oxide (MgO) or other alkaline earth oxides. These additives prevent the formation of complex alkali iron sulphates by forming stable compounds with one or more of their components. The lower alloy Cr-Mo steels have limited corrosion resistance to highly aggressive coals. Although some improvement can be achieved by using 9Cr-1Mo steels, maximum corrosion resistance requires the use of stainless steels. In oil-fired boilers, the principal source of corrosion comes from a fluxing action of molten Na – V complexes with the protective oxide scale formed on steel surfaces. Although this can occur at lower temperatures if the current ratio of Na to V is present, this form of corrosion generally takes place at temperatures above 600 deg C. Super-heater and re-heater tube corrosion rates of as much as 0.75 mm/annum have been observed in field measurements. An effective method of preventing oil ash corrosion is to remove V, alkali metals, and S chemically from the fuel. However this approach is costly. Certain Ca and magnesium (Mg) compounds have been found to be effective in reducing corrosion rates. These compounds form high melting point complexes with oil ash constituents. In terms of alloy steel selection, it has been found that the 9Cr-1M alloys show very good corrosion resistance to oil ash corrosion. In addition, modifications of these alloys with additional Mo and/or V provide high corrosion resistance and increased strength. Thus, for this application, alloy steels are available at a lower cost than stainless steels. Steam/water side corrosion is another major problem encountered in fossil fuel power plants. In many cases, contaminant deposition reduces equipment efficiency and induces corrosion by a variety of mechanisms and is implicated in a variety of boiler tube failure mechanisms that are most common in water walls and economizers, which are often constructed from low Cr ferritic steels. Water side deposits frequently begin as accumulations of corrosion products transported to the boiler from other parts of the system. The corrosion product deposit is porous, unlike the protective magnetite (Fe3O4) film. This porous deposit serves as a trap for corrosive impurities, such as caustic, chlorides, and acid sulphates. Alloy steel boiler tube failures in steam containing tubes have also almost exclusively been the result of contaminant entrainment within the steam. Chlorides, sulphates, and caustic are the most common contaminants. However, the growth of Fe3O4 on the inside tube surface can also be a secondary contributor to tube failure. If its rate of growth is excessive, this acts as a thermal barrier and causes the tube wall temperature to rise, sometimes above the point at which excessive creep damage results in an overheating failure. High strength Cr-Mo and Ni-Cr-Mo alloy steels are also used in components for commercial light water reactors. Many modern light water reactor steam turbine rotors are made from 3.5NiCrMoV steels. A serious concern associated with steam turbine materials is that of SCC, which occurs in quenched and tempered and normalized and tempered low alloy steels with a wide range of grain sizes. Metallurgical and environmental conditions influence SCC behaviour in low alloy steels and methods are available for reducing or eliminating SCC. Wet steam erosion-corrosion of nuclear plant piping represents another serious problem which leads to costly power outages and repairs. The most widely used material for nuclear plant wet steam pipes is C steel, which has shown a susceptibility to erosion-corrosion. However, with alloying additions of Cr, Cu, and Mo, erosion-corrosion resistance can be significantly improved. In comparison to ordinary C steel, erosion-corrosion rates can be reduced by three times with C-Mo steel and more than ten times with Cr-Mo steels. Field experience has shown that 1.25Cr, 0.5Mo, and 2.25Cr-1Mo steels are virtually immune to erosion-corrosion in nuclear power plant applications. The disposal of high level nuclear waste in deep underground repositories requires the development of waste packages which keeps the radioisotopes contained for periods of up to 1000 years. The primary geologic media currently being considered in some places for repository siting are salt, basalt, tuff, and granite. A number of alloy steel and other iron base materials are usually considered for the structural barrier members of waste packages. Their uniform and non-uniform (pitting and inter-granular) corrosion behaviour and their resistance to SCC in aqueous environments relevant to salt media are important. C and alloy steels are extensively used for submerged or partly submerged structures, both in ports (e.g. sea walls and piers) and offshore (e.g. oil drilling platforms). However, low alloy steels show better resistance to marine corrosion. Marine structures show five separate zones which are susceptible to corrosion at different rates, depending primarily on elevation above the tidal zone of depth or immersion in seawater. These zones are described below. 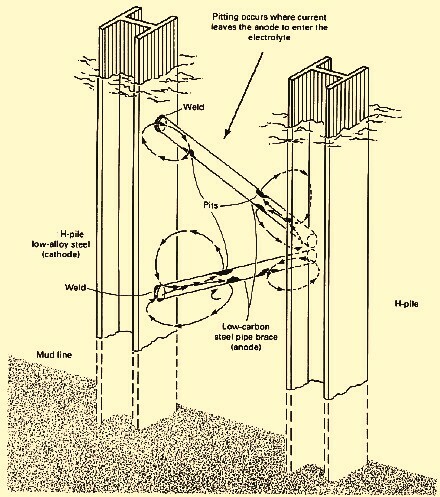 Marine atmospheric-zone – This is the portion of the elevated structure subject to a marine atmosphere, including sea mist and high relative humidity, but without significant wetting by splash from waves. Splash zone – This is the portion above the level of mean high tide that is subject to wetting by large droplets of seawater. Tidal zone – This is the portion of the structures, which is between mean-high tide and mean-low tide. The structure is alternately immersed in seawater and exposed to a marine atmosphere. Submerged zone – This is the portion of the structure from about 0.3 m to 1 m below mean low tide down to the mud line. Subsoil zone – This is the portion below the mud line, where the structure has been driven into the ocean bottom. The effects of each of these zones on the corrosion behaviour of alloy steels show that the marine atmospheres (zones 1 and 2) and marine environments (zones 3 to 5) and the variables (such as salinity, temperature, pollutants, and biological activity) influences corrosion of the alloy steels. Atmospheric zone corrosion – Low alloy steels demonstrate greatly improved resistance to marine environments compared to the resistance of C steels. The first indication that composition affects corrosion behaviour has been the observation that Cu bearing steels show improved endurance in industrial environments. It has been later found Cu bearing steels also perform better than plain C steels at the marine sites. A number of marine corrosion studies have evaluated the benefits of Cu, Ni, Cr, and P (phosphorus) additions to steel. The benefit derived from the addition of Cu to steel exposed to an industrial environment has been attributed to the relatively insoluble basic sulphates from the SO2 in the polluted air, which slowly develop a fine grain, tightly adherent protective scale film. Additions of Ni, Cr, Si (silicon), and P also promote relatively insoluble corrosion products. Chlorine has a deleterious effect on the protective scale layer of the alloy steels, and the manner in which protective scale coats form in marine environments is less understood than in the case of the industrial environment. However, tests have shown that alloying additions provide enhanced corrosion resistance in marine environments and there are positive effects of individual additions of Cu Ni and Cr on the corrosion of alloy steels in a marine environment (Fig 3). Splash zone and tidal zone corrosion – Low alloy steels experience distinctly less corrosion at the splash zone (zone 2) than the C steel. Some experimental results comparing 6 m samples of C steel and alloy steel after 5 years of exposure to splash, seawater, and mud zones shows that at the 0.45 m and 0.75 m levels, the loss in thickness for the C steel is three to six times higher than that for the low alloy steels. Other experiences with low alloy steels, especially in exposures in which the wave action is vigorous, also indicate that they have significant advantage for splash zone service. Submerged zone – Low alloy steels show corrosion rates in the range of about 65 micro metres to 125 micro metres per annum when fully immersed in seawater. As such, low alloy steels offer no particular advantage over C steel in applications involving submergence in the marine water. The inferior corrosion performance of alloy steels in seawater is due to the fact that the special conditions in the atmosphere, which lead to the formation of the protective scale films, do not operate in the submerged condition. Low alloy steels also develop deeper pits in seawater than C steels do. This is established by the 8 year results from the sea water exposures. When comparing the average pitting value with the weight loss penetration, it is seen that the ratio of these two values for low C steel at the 4.25 m depth is 2.6. The range for the alloy steel, some of which have higher weight loss penetrations to start with, is 1.6 to 3.7. At the mean tide level, the factor is lower, as is the pit depth for many of the steels involved in the comparison. For a given strength, the designer is tempted to specify a thinner wall for low alloy steel in a seawater application. Because the corrosion rate is higher, corrosion failure is more rapid. Thus, from a design standpoint, the corrosion allowance for a low alloy steel is to be greater than that for low C steel. However, low alloy steels have good strength characteristics, and if protective coatings were applied, these steels can be used to advantage. Cathodic protection is required to be applied with care for HSLA steels because some tend to be more susceptible to H2 damage than C steels. Sub soil zone – Bottom conditions in an ocean vary, but local attack is sometimes observed just above the mud zone or in the bottom mud itself. As in the soil, bottom mud is often aggressive to steel because of the presence of sulphate reducing bacteria. For steel structures standing in the mud, the anodic and cathodic sites may be a considerable distance apart, and their locations may shift somewhat with time. Galvanic corrosion in seawater is a matter of concern because the corroding medium has a fairly high conductivity. Service conditions can differ considerably because of solution composition, solute concentration, agitation, aeration, temperature, and purity of the steels, as well as corrosion product formation and biological growth, each of which can result in a different galvanic series. In a structural joint, the ratio of the areas of two dissimilar metals has enormous influence on the corrosion rate of one of the members of the joint (the one that is more anodic in the galvanic series). The greater the ratio of the cathode to the anode, the greater is the corrosion rate. A surprisingly small difference in solution potential can often result in a substantial difference in corrosion rate. As an example, tests were conducted in which C steel was coupled to itself, to HSLA steel, and to stainless steel and in which HSLA steel was coupled to itself, and to stainless steel. The results of these tests after 6 months of immersion in seawater show that the coupling C steel to stainless steel in an anode-to-cathode ratio of 1:8 can result in an approximately eightfold greater corrosion loss for the C steel. Also important to design engineers is the significant increase in corrosion that occurs when C steel is coupled to HSLA steel, despite the fact that their solution (galvanic) potentials are practically the same. An example of a C steel/alloy steel galvanic couple is shown in Fig 4. The selection of alloy steels for ship and submarine hulls, structures, and deck railings is based on toughness, ductility, and weldability rather than corrosion performance. Protection from corrosion is generally provided by coatings and cathodic protection. Many factors influence corrosion in the chemical processing industry. Temperature, pressure, and velocity of the process stream all affect corrosion, and minute amounts of contaminants can result in large increases in corrosion rates. The use of alloy steels in such environments is generally limited to static or low velocity applications, such as storage tanks or low velocity piping. Applications for non-protected steel are particularly limited. More often, some form of protection is used both to protect the steel equipment and to maintain the purity of the product. Organic linings are commonly used for this purpose. The use of cathodic and anodic protection is also becoming more common. Some applications for alloy steels in the chemical-processing industry are listed below. Sulphuric acid – Steel tanks are used to store sulphuric acid at ambient temperatures at all concentrations to 100 %. Corrosion can rapidly become catastrophic at these concentrations and at temperatures above 25 deg C. When product purity is of concern, anodic protection can be used to limit iron contamination over long storage periods. The addition of 0.1 % to 0.5 % Cu to steels used for sulphuric acid storage has been shown to reduce corrosion rates in acid concentrations up to around 55 %, but this beneficial effect has not been observed at concentrations higher than 60 %. Organic acids – Alloy steel can be used for ambient temperature storage of some high molecular weight organic acids, but steel is attacked rapidly by formic, acetic, and propionic acids. Alkalis – Bare steel storage tanks are used for sodium hydroxide at concentrations to 50 % and at temperatures to around 65 deg C. Where iron contamination of the product is of concern, spray applied neoprene latex or phenolic epoxy linings are used. Anhydrous ammonia – Low alloy steel storage tanks have been used for many years for ammonia storage. SCC has been the primary corrosion problem in vessels used for ammonia storage. It has been shown in several investigations that high stresses and oxygen (air) contamination are the primary causes of such cracking and that the addition of 0.1 % to 0.2 % H2O inhibits SCC in alloy steel storage vessels. Chlorine – Steel is used to handle dry chlorine, and corrosion rates are generally low. However, ignition is a problem and the recommended maximum service temperature in this application is 150 deg C. Steel is also used to handle refrigerated liquid chlorine, but care is required to be taken at potential leak sites. Chlorine from small leaks can be trapped beneath ice formed on the equipment and this form corrosive wet chlorine gas.